Good and happy year 2011 and full with beautiful photographs. how this one, cheer!. Tous mes voeux de bonheurs pour cette nouvelle Année 2011 !!!! Beautiful winter scene. Looks as if it could have just as easily been taken here in Canada. Maravillosa imagen para terminar el año, de una gran calidad. 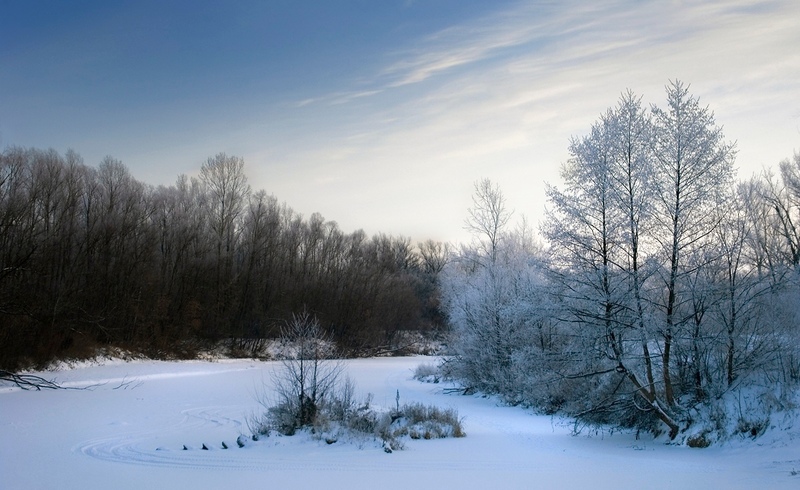 Lovely winter shot - and I'd like to add mu=y good wishes for a happy, prosperous and creative new year. Wonderful winter image! Looks very nice with the blue sky. This a very fine image, I like the contrast from the light and frost - and the detail with the tracks in the snow! We have had a long and hard winter for a long time alaready now here in Denmark - I think the eastern winds brings it from you ;-) - I have not seen your blog before - found it via your comment on Kala's... I will be back!